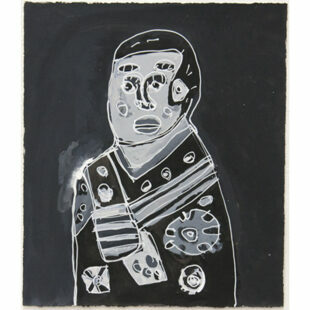 Alan Constable is a multi-disciplinary artist whose practice spans drawing, painting and ceramics. He is most renowned for his ceramic cameras, which the National Gallery of Victoria recognised when they acquired thirteen pieces presented in 'Melbourne Now' in 2014. Constable began developing these tactile sculptures in 2007, and they reflect his life-long fascination with old cameras. Alan Constable (born 1956) has worked in the Arts Project studio since 1991 and had his first solo show in 2011. He has had solo shows at Andrew Baker Art Dealer, Brisbane; Darren Knight Gallery, Sydney; South Willard, Los Angeles; and Stills Gallery, Sydney. He has featured in numerous group shows and awards including Victorian Craft Award, Melbourne; National Gallery of Victoria, Melbourne; and at MADMusée, Belgium. He has collections in the National Gallery of Victoria, Melbourne; and The Museum of Everything, London. Please contact Darren Knight, Sydney; DUTTON, New York; or Arts Project Australia, Melbourne if you are interested in viewing Alan Constable's ceramic cameras.